Ken and Sara talk to author Douglas Hunter about his book linked below. The story of Dighton Rock and its relationship with the indigenous past is a fascinating tale. Petroglyphs in Wisconsin? That's right. And they're fine examples of local animals of the time along with more abstract designs. Petroglyphs, rock shelters, caves, and F-18s can all be seen at Grimes Point. Located just outside Fallon Naval Air Station and Top Gun, Grimes Point contains some of the oldest rock art in the Great Basin. On today's episode we learn about the heritage site in Arizona known as Honanki. It's an amazing cliff dwelling and rock art site that was inhabited by the Sinagua people of the Ancient Pueblo Peoples. On today's episode Kenneth Feder continues the series based on his most recent book, "Ancient America: 50 Archaeological Sites You Should See For Yourself", with Nine Mile Canyon. 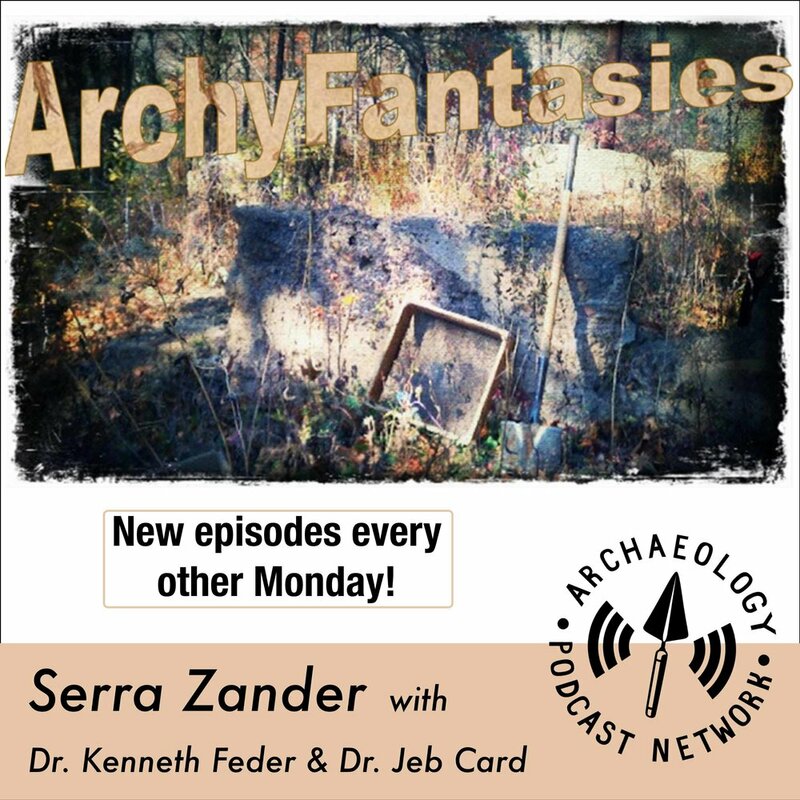 On today's episode Kenneth Feder continues the series based on his most recent book, "Ancient America: 50 Archaeological Sites You Should See For Yourself", with McConkie Ranch. On today's episode Kenneth Feder continues the series based on his most recent book, "Ancient America: 50 Archaeological Sites You Should See For Yourself", with the San Juan River. On today's episode Kenneth Feder continues the series based on his most recent book, "Ancient America: 50 Archaeological Sites You Should See For Yourself", with Hovenweep National Monument. On today's show, we learn about the White River Narrows Archaeological District in Lincoln County, Nevada. WRN has some of the best examples of petroglyphs in the area and has a lot to teach us about prehistoric lifeways in that area. On today's episode Kenneth Feder continues the series based on his most recent book, "Ancient America: 50 Archaeological Sites You Should See For Yourself", with Crow Canyon. On today's episode Kenneth Feder continues the series based on his most recent book, "Ancient America: 50 Archaeological Sites You Should See For Yourself", with Dinosaur National Monument. On today's episode Kenneth Feder continues the series based on his most recent book, "Ancient America: 50 Archaeological Sites You Should See For Yourself", with Sego Canyon. On today's episode Kenneth Feder continues the series based on his most recent book, "Ancient America: 50 Archaeological Sites You Should See For Yourself", with Petroglyph National Monument. On today's episode Kenneth Feder continues the series based on his most recent book, "Ancient America: 50 Archaeological Sites You Should See For Yourself", with Dinwoody Lake Petroglyphs. On today's episode Kenneth Feder continues the series based on his most recent book, "Ancient America: 50 Archaeological Sites You Should See For Yourself", with Little Petroglyph Canyon. On today's episode we learn about petroglyphs and pictographs - ancient art that has filled researches and the public with wonder, fascination, and a desire to get to the bottom of the mystery of their creation. On today's episode Kenneth Feder continues the series based on his most recent book, "Ancient America: 50 Archaeological Sites You Should See For Yourself", with Horsethief Lake Petroglyphs. On today's episode Kenneth Feder continues the series based on his most recent book, "Ancient America: 50 Archaeological Sites You Should See For Yourself", with the Three Rivers Petroglyph Site in New Mexico. It's a little off the beaten path but well worth the visit. Apologies for being a few days late - had to do some extra work with this one. PaleoWest, a CRM firm based in the Southwest, won a contract to record 200 meters of the 1600-meter-long Little Petroglyph Canyon located on the ultra-secure China Lake Naval Weapons Station in Ridgecrest, California. The Navy wants to record the entire massive petroglyph assemblage but isn't really sure of what the best, most efficient way to do that is. So, PaleoWest was hired to test out different technologies and report on their findings. We talk to the PaleoWest Chief of Operations, Shawn Fehrenbach, about their efforts.